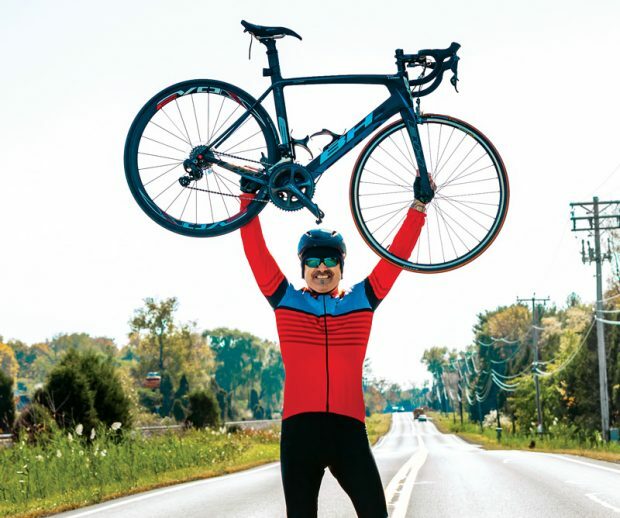 The medical knowledge of his fellow cyclists, paired with top-tier care at HealthAlliance Hospital, helped save Oscar Hernandez’s life. For the avid cyclists of Woodstock, Thursday evenings mean one thing: a scenic ride through the hills, organized by Overlook Bicycles. On August 2, 2018, two riders who’d noticed each other in passing exited their cars at the same time: Oscar Hernandez of Saugerties and Nicholas Varga, an ultrasound technologist at HealthAlliance Hospitals, members of the Westchester Medical Center Health Network (WMCHealth). “I remember that I waved, and he waved back,” says Varga, who’d planned to go to his night shift at HealthAlliance after his ride. When they started the 30-mile journey, neither had any clue they would interact further. Hernandez, who works in the service industry, rides with the group in rain, snow or shine. “I’m in better shape now at 53 than I was at 20,” he says. He also enjoys hiking, canoeing and white-water rafting; he swore off red meat and tobacco decades ago. “For me, life is outside,” he says. Toward the end of the ride, Varga had ascended a small hill and was chatting with others at the summit. Hernandez hung farther back, struggling to climb. He was later told that he said, “I feel tired,” and suddenly fell over. A woman, cycling near Hernandez, braked to help. “He was not moving, looked pale and felt cold,” Hernandez’s wife, Carla, recounts. Another cyclist dialed 911. Varga sprinted down the hill to check Hernandez for a pulse. Failing to detect one, he began CPR. Although he had worked as an emergency medical technician, Varga says he never expected to perform CPR on a fellow cyclist in cardiac arrest. “Luckily, my training took over, and I didn’t skip a beat — no pun intended,” says Varga, who was assisted by another cyclist. Two minutes later, Varga recalls, Woodstock police arrived with an AED, or defibrillator, and delivered the shock that restarted Hernandez’s heart. Woodstock medics arrived almost immediately and detected a pulse: “a good, normal sinus rhythm,” Varga says, recalling his relief. The ambulance brought Hernandez to the Emergency Department at HealthAlliance Hospital: Broadway Campus; Varga arrived for work shortly after. Matthew Stupple, MD, an emergency-medicine specialist at HealthAlliance Hospital: Broadway Campus, had to make some quick decisions. “Oscar had his pulse and blood pressure back, but it was obvious he had to go on a breathing tube to assist respiration,” he says. The clinical team started him on a hypothermia (cooling) protocol, lowering his core temperature to around 90 degrees, to suppress inflammation and reduce the body’s demand for oxygen. Hernandez also received medication for ventricular fibrillation, the irregular rhythm triggered that caused his “V-fib arrest” and collapse. It was clear that he needed to be taken to Westchester Medical Center, the flagship of WMCHealth, for an advanced procedure to investigate and treat the cause of the cardiac arrest. Interventional cardiologist Srihari S. Naidu, MD, then implanted one long stent, reopening the vessel and restoring blood flow. When Hernandez woke up, he looked around and asked his wife, Carla what had happened. The good news was that his heart muscle remained undamaged, and he was otherwise in excellent physical condition. After some rest, he could ease back into exercise and start riding his bike again. “Music sounds like never before,” says Hernandez of his new lease on life. “My Scotch tastes like honey. And I want to reconnect with all my friends.” To that end, in September, Oscar and Carla hosted an “It’s great to be alive!” party. They invited all the riders, including Varga, to celebrate the stars that had aligned the evening of August 2. To learn more about the WMCHealth Heart & Vascular Institute at HealthAlliance Hospital, call 845.339.3663.